Red Clover (Trifolium pratense) - As you walk through the threshold of expanded consciousness wrapped in Light, transform lower frequency emotions that stand in your way of progressing with ease. I AM peaceful ease while stepping into expanded states of consciousness. Red clover is grown as a nitrogen fixer to heal depleted soil and provide animal fodder. 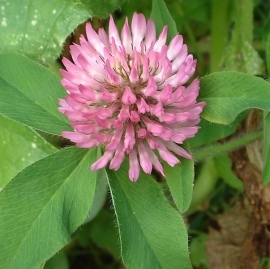 It is a source of many valuable nutrients including calcium, chromium, magnesium, niacin, phosphorus, potassium, thiamine, and vitamin C. Red clover is also considered to be one of the richest sources of isoflavones (water-soluble chemicals that act like estrogens and are found in many plants). Tea or tincture of red clover is helpful for a number of symptoms such as irregular periods, sore joints, anxiety, energy loss and hot flashes. Desiring a deeper, wider, more full spectrum experience of consciousness yet feeling held back by anger, fear, impatience or other negative emotional states. Red Clover Flower Essence supports your transition into more expanded states of consciousness by transforming lower frequency emotional states rooted in the emotional subtle body, nervous system and body biochemistry. This essence was made with the “no-pick” method of bringing the frequency of the plant spirit directly into the mother/storage bottles as they are sitting with the plant. During this process, crystals of amber, amethyst, herkimer diamond, icosahedron quartz, red aventurine, red and white stilbite, sugalite and drusy quartz were placed among the plants with the storage (mother) bottles. The sun acts as a transformer to step down spiritual energies from higher dimensions. While the essence was being made, Amber acted as a lens to receive and focus sunlight for this purpose. It also aligns the subtle bodies with the physical bodies, transmutes negative energy into positive energy, and emits a sunny and soothing energy that calms and enlivens the disposition. Amethyst brings peace and contentment. It enhances clear communication between your mental, physical and emotional bodies and between the physical and spiritual worlds, while translating those communications into daily activities. Herkimer diamond, as a manifestation of solidified spiritual light, takes you as far as you can go toward the highest octave of Spirit while staying in your physical body on Earth. It also enhances the properties of other stones. Icosahedron cut quartz has 20 (5X4) equilateral sides. It is a bridge between the 5th Dimension - the entry into the unified Spiritual realms - and the 4 cardinal directions (N, S, E, W) on Earth. Red aventurine aligns you with your highest path and encourages fortitude, discernment, commitment and perseverance to stay on that path. Red and white stilbite has a healing effect on the mind and energy fields. It supports you when you feel overwhelmed or unclear about how to integrate the rapid change on your spiritual path. Sugilite opens the heart chakra to unconditional love and helps you to manifest spiritual love on the Earth plane. It strengthens spirituality, psychic ability and channeling. Drusy quartz crystals help to energize and stabilize your subtle bodies. The actions of the crystals inform the way this flower essence seats into the body/mind.